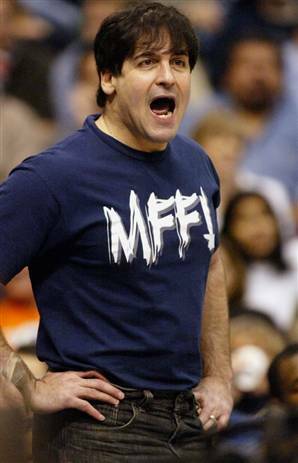 Mark Cuban: A Galtian Overlord who believes in society. Back in 1981 Republicans might not have liked a proposal to tax millionaires to at least the same extent that we tax mere mortals, but they would have been reluctant to oppose it on the grounds that our economy depends entirely on rich people maximizing their incomes. You could believe that, but you couldn't say it out loud. This inhibition no longer burdens the GOP. "When you are raising these top tax rates," Rep. Paul Ryan (R., Wisc.) said on Fox News Sunday, "you're raising taxes on these job creators where more than half of Americans get their jobs from in this country." The most frustrating aspect of modern political life is the fact that the American public has internalized the (false) idea that magical self-made rich supermen don't owe anything to the society that nurtured them because they've earned every dime of their fortunes all by themselves without any help from the government. The reality, of course, is just the opposite. Let's take a well-known Galtian Overlord such as Steve Jobs, truly one of the most inventive CEOs of our generation. Contrary to what you may have heard, Jobs did not, in fact, teach himself how to read and do math. Rather, he attended a public high school, just like the vast majority of looters American children. The young Jobs was able to attend school in the first place because of government regulations that barred child labor and mandated schooling. Added to this, the young Jobs benefited from having publicly-funded police and fire departments that ensured that he survived until he was rich enough to afford his own private security detail. If Rick Perry had been governor of California and had dramatically slashed funds to first responders, then our budding young Galtian Overlord might have died in a wildfire instead of inventing the iPhone. And of course there are other ways Jobs has benefited from the government, from a legal system that protects his company's intellectual property to a military that prevents the Queen of England from coming into his home and bossing him around to a social safety net that insured that even if he had never been a success, he wouldn't have died destitute in the street and unable to pay his medical bills in his old age. And that's not to mention that Steve and his fellow Galtians also used to benefit from now-repealed banking regulations such as Glass-Steagall that ensured financial stability and dramatically lessened the chances that a financial crisis would cripple the economy. So be Patriotic. Go out there and get rich. Get so obnoxiously rich that when that tax bill comes , your first thought will be to choke on how big a check you have to write. Your 2nd thought will be “what a great problem to have”, and your 3rd should be a recognition that in paying your taxes you are helping to support millions of Americans that are not as fortunate as you. In these times of “The Great Recession” we shouldn’t be trying to shift the benefits of wealth behind some curtain. We should be celebrating and encouraging people to make as much money as they can. Profits equal tax money. While some people might find it distasteful to pay taxes. I don’t. I find it Patriotic. I’m not saying that the government’s use of tax money is the most efficient use of our hard-earned capital. It obviously is not. In a perfect world, there would be a better option. We don’t live in a perfect world. We don’t live in a perfect time. We live in a time where the government plays a big role in an effort to help lead us out this Great Recession. That’s reality. Cuban's attitude is certainly the right one. It would be nice if more of his fellow Galtians decided to adopt it.